Definition at line 38 of file llcurrencyuimanager.h. Definition at line 400 of file llcurrencyuimanager.cpp. Definition at line 405 of file llcurrencyuimanager.cpp. Definition at line 501 of file llcurrencyuimanager.cpp. Definition at line 462 of file llcurrencyuimanager.cpp. References canBuy(), LLConfirmationManager::confirm(), impl, llformat(), LLCurrencyUIManager::Impl::mSiteConfirm, LLCurrencyUIManager::Impl::mSiteCurrencyEstimatedCost, LLCurrencyUIManager::Impl::mUserCurrencyBuy, LLUIString::setArg(), and LLCurrencyUIManager::Impl::startCurrencyBuy(). Definition at line 496 of file llcurrencyuimanager.cpp. References impl, LLCurrencyUIManager::Impl::mTransactionType, and LLCurrencyUIManager::Impl::TransactionBuy. Definition at line 489 of file llcurrencyuimanager.cpp. 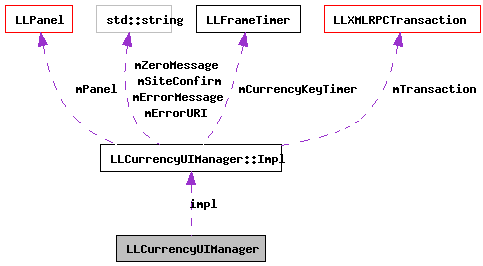 References impl, LLCurrencyUIManager::Impl::mSiteCurrencyEstimated, LLCurrencyUIManager::Impl::mTransactionType, LLCurrencyUIManager::Impl::mUserCurrencyBuy, and LLCurrencyUIManager::Impl::TransactionNone. Referenced by buy(), and LLFloaterBuyCurrencyUI::updateUI(). Definition at line 484 of file llcurrencyuimanager.cpp. Referenced by LLFloaterBuyLandUI::canClose(), and LLFloaterBuyCurrencyUI::canClose(). Definition at line 511 of file llcurrencyuimanager.cpp. Referenced by LLFloaterBuyLandUI::draw(), and LLFloaterBuyCurrencyUI::updateUI(). Definition at line 516 of file llcurrencyuimanager.cpp. Definition at line 419 of file llcurrencyuimanager.cpp. Referenced by LLFloaterBuyLandUI::refreshUI(), LLFloaterBuyLandUI::runWebSitePrep(), LLFloaterBuyLandUI::startBuyPreConfirm(), LLFloaterBuyCurrencyUI::updateUI(), and LLFloaterBuyLandUI::updateWebSiteInfo(). Definition at line 438 of file llcurrencyuimanager.cpp. References impl, LLCurrencyUIManager::Impl::mSiteCurrencyEstimated, and LLCurrencyUIManager::Impl::mSiteCurrencyEstimatedCost. Referenced by LLFloaterBuyLandUI::refreshUI(), LLFloaterBuyLandUI::runWebSitePrep(), and LLFloaterBuyLandUI::startBuyPreConfirm(). Definition at line 506 of file llcurrencyuimanager.cpp. Definition at line 479 of file llcurrencyuimanager.cpp. References impl, LLCurrencyUIManager::Impl::mTransactionType, and LLCurrencyUIManager::Impl::TransactionNone. Definition at line 443 of file llcurrencyuimanager.cpp. Referenced by LLFloaterBuyLandUI::postBuild(), and LLFloaterBuyCurrencyUI::postBuild(). Definition at line 454 of file llcurrencyuimanager.cpp. References LLCurrencyUIManager::Impl::checkTransaction(), LLCurrencyUIManager::Impl::considerUpdateCurrency(), and impl. Referenced by LLFloaterBuyLandUI::draw(), and LLFloaterBuyCurrencyUI::draw(). Definition at line 410 of file llcurrencyuimanager.cpp. References impl, LLCurrencyUIManager::Impl::mCurrencyChanged, LLCurrencyUIManager::Impl::mUserCurrencyBuy, LLCurrencyUIManager::Impl::mUserEnteredCurrencyBuy, and LLCurrencyUIManager::Impl::updateUI(). Referenced by LLFloaterBuyCurrencyUI::noTarget(), LLFloaterBuyCurrencyUI::target(), and LLFloaterBuyLandUI::updateParcelInfo(). Definition at line 429 of file llcurrencyuimanager.cpp. References impl, LLCurrencyUIManager::Impl::mCurrencyChanged, LLCurrencyUIManager::Impl::mSiteCurrencyEstimated, LLCurrencyUIManager::Impl::mSiteCurrencyEstimatedCost, and LLCurrencyUIManager::Impl::updateUI(). Definition at line 424 of file llcurrencyuimanager.cpp. Definition at line 448 of file llcurrencyuimanager.cpp. References impl, LLCurrencyUIManager::Impl::mHidden, and LLCurrencyUIManager::Impl::updateUI(). Referenced by LLFloaterBuyLandUI::refreshUI(), and LLFloaterBuyCurrencyUI::updateUI(). Definition at line 90 of file llcurrencyuimanager.h. Referenced by bought(), buy(), buying(), canBuy(), canCancel(), errorMessage(), errorURI(), getAmount(), getEstimate(), hasError(), inProcess(), prepare(), process(), setAmount(), setEstimate(), setZeroMessage(), updateUI(), and ~LLCurrencyUIManager().